The Latin Quarter of Paris is an area in the 5th and the 6th arrondissements of Paris. It is situated on the left bank of the Seine, around the Sorbonne. The Montagne Sainte-Geneviève is a hill overlooking the left Bank of the Seine in the 5th arrondissement of Paris. Atop the Montagne, are the Panthéon and the Bibliothèque Sainte-Geneviève, used by the students of the University of Paris (La Sorbonne). The side streets of the Montagne feature bars and restaurants, for example, in the Rue Mouffetard. Moreover, the former campus of the École Polytechnique, located on the Montagne, now is the Ministry of Research. On the other side of the Montagne lie the rue d'Ulm and the École Normale Supérieure. Around AD 1110, the scholar and philosopher, Peter Abelard, established a school on the Montagne; twenty-six years later, Abelard returned, in the year 1136. The Boulevard Saint-Germain is a major street in Paris on the Left Bank of the River Seine. It curves in a 3½ kilometre arc from the Pont de Sully in the east (the bridge at the edge of the Île Saint-Louis) to the Pont de la Concorde (the bridge to the Place de la Concorde) in the west and traverses the 5th, 6th and 7th arrondissements. At its midpoint, the Boulevard Saint-Germain is traversed by the north-south Boulevard Saint-Michel. The boulevard is most famous for crossing the Saint-Germain-des-Prés quarter from which it derives its name. The Boulevard Saint-Michel is one of the two major streets in the Latin Quarter of Paris (the other being the Boulevard Saint-Germain). It is a tree-lined boulevard which runs south from the pont Saint-Michel on the Seine river and the Place Saint-Michel, crosses the boulevard Saint-Germain and continues alongside the Sorbonne and the Luxembourg gardens, ending at the Place Camille Jullian just before the Port-Royal railway station and the avenue de l'Observatoire. It was created by Baron Haussmann to run parallel to the rue Saint-Jacques which marks the historical north-south axis of Paris. The boulevard serves as a boundary between the 5th and 6th arrondissements of Paris; odd-numbered buildings on the eastern side are in the 5th arrondissement and even numbers on the western side are in the 6th. It has a length of 1380 m, an average width of 30 m and takes its name from the pont Saint-Michel. In slang, the boulevard is sometimes referred to as the Boul'Mich. 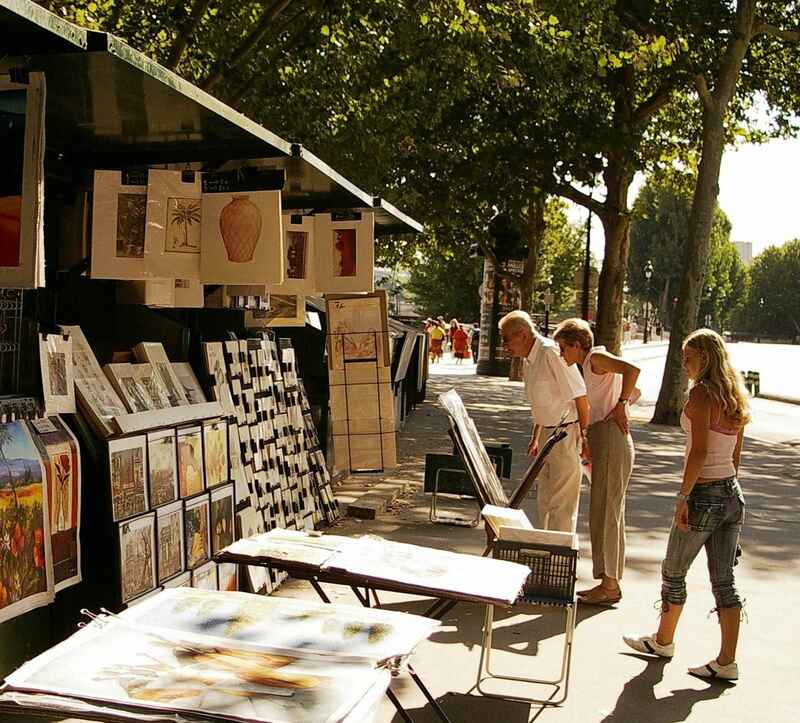 As the central axis of the Latin Quarter, it has long been a hotbed of student life and activism, but tourism is also a major commercial focus of the street and designer shops have gradually replaced many small bookshops. The northern part of the boulevard is now the most frequented, due to its bookstores (such as Gibert Joseph and the Gibert Jeune), cafés, cinema and clothes shops. The main buildings of the boulevard are the Musée de Cluny, the lycée Saint-Louis, the École des Mines, and the cité universitaire, the university area of the Sorbonne. 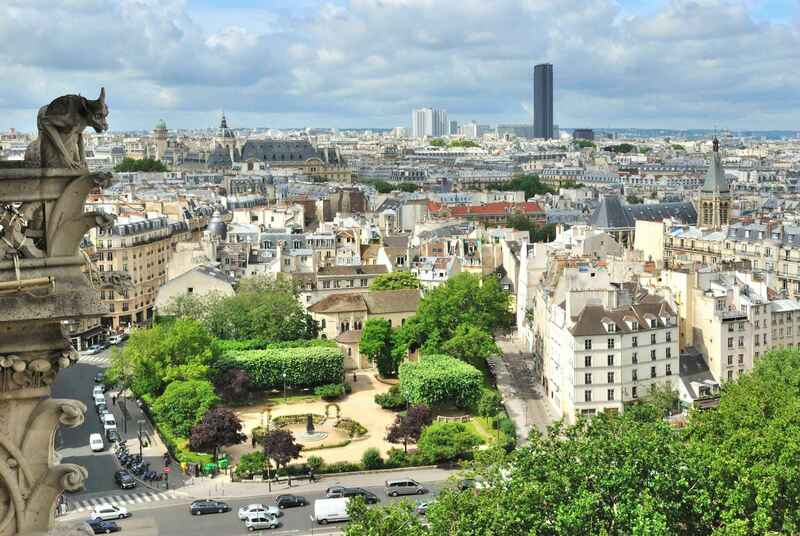 Montparnass is an area of Paris, France, on the left bank of the river Seine, centred at the crossroads of the Boulevard du Montparnasse and the Rue de Rennes, between the Rue de Rennes and boulevard Raspail. Montparnasse was absorbed into the capital's 14th arrondissement in 1669 . The area is also known for cafes and bars, such as the Breton restaurants specialising in crêpes (thin pancakes) located a few blocks from the Gare Montparnasse. Latin Quarter | eTips Inc.